Profit - Governor Clinton was appropriated $7 million from New York State for the Erie Canal in 1817. No federal funding was used for the construction of the Canal, and by the time toll collection ended in 1882, over $121 million had been collected. Construction costs were $78 million for the original and enlarged Canals, and maintenance costs about $30 million, so the Canal made a small profit. Expansion - The Canal was enlarged shortly after 1825 (until the 1860s) to 70 feet wide, 7 feet deep, 72 locks and included rivers and lakes. Who Built the Canal - Many local people and itinerant laborers, helped to build the Canal. Some of these were immigrants, but the fabled large numbers of Irish immigrants worked on the enlargement projects, not original construction. Farmers who worked on the construction of the Canal across their land were given materials to build bridges; they weren’t given much, so these were the “low bridges” made so famous by the song! The construction was supervised by contractors who agreed to build a certain number of miles in a section for an agreed-upon price. Faster Passageway – Prior to the Canal, traveling across the state of New York took 4-6 weeks. The Canal reduced it to 6-11 days. Empire State - The Erie Canal made New York the Empire State. It was designed to be a much-needed route from the Atlantic Ocean to the Great Lakes. Overland travel was expensive, difficult, and very time-consuming. Raw materials, finished goods, and people moved across New York and in and out of the interior of the country on the Canal. Canal’s Influence on New York City - When the canal fully opened in 1825, New York was already an important port city, but so were Philadelphia, Boston, Baltimore, and New Orleans. Within 15 years of the Canal&apos;s opening, New York was the busiest port in America, moving tonnages greater than Boston, Baltimore and New Orleans combined. The Appalachian Mountain Range is a formidable barrier between the east coast and the rest of the continental US. The mountain range is about 1,500 miles in length, extending from Canada all the way to central Alabama. The natural break at the Mohawk River provided a connection to the Great Lakes, and thus the west. The Erie Canal gave New York City a huge advantage over Philadelphia, Boston, and Baltimore. The Erie Canal ensured the status of New York City as America’s premier seaport, commercial center, and gateway to the interior. Mother of Cities – The Erie Canal gave rise to some of the state’s major cities, including Rochester, Buffalo, and Syracuse. Syracuse’s population exploded as a result of the Canal and Canal-related industry, from 250 in 1820 to over 22,000 by 1850. The Canal helped to transport salt (Syracuse’s #1 industry) and beer. In Canal days, Syracuse was also known as a prominent producer of beer. Immigrants from Germany and Ireland used barley and hops shipped along the Canal, and in 1880 there were 40 breweries in Syracuse. The peak of production was 1896, when over 300,000 barrels of beer were produced. Social Impacts – The Erie Canal is credited for helping to impact Women’s Rights and religion. Not only was it known to transport goods, and people, it transported ideas as well. Civil War Outcome - The American Civil War might have gone differently, if it wasn&apos;t for the Erie Canal! The canal really did help “bind the Union,” as early canal supporters hoped it would. It reinforced connections between the eastern seaboard and the still largely unsettled but expanding territories to the west. For that reason (of course we cannot know this for sure), many historians believe that the Erie Canal had a major impact on the outcome of the American Civil War by transporting food and material and strengthened economic and social ties between the northeastern seaboard and the Midwest. Established ties, maintained by 35 years of commerce and migration along the Erie Canal, meant that residents of Ohio, Illinois, Indiana, Michigan, Wisconsin, and Minnesota generally supported union rather than secession. If the Erie Canal had not been constructed, most of the commerce of the Midwest would have followed the Mississippi to and from New Orleans, and social, economic, and political sympathies might have taken a different form. Moving Canal Boats - Boats moving along the original and enlarged Canal were pulled by mules. They are smart and fast, and can survive on less food and water than horses. They don’t spook as easily as horses and if they fell into the Canal, they had an easier time climbing out. The mules were often driven by children, some belonging to families that owned canal boats, and others were orphans hired and sometimes exploited by boat captains. Banks - Banks were built in Syracuse to receive Canal toll deposits; by 1870, there were 13 banks here. 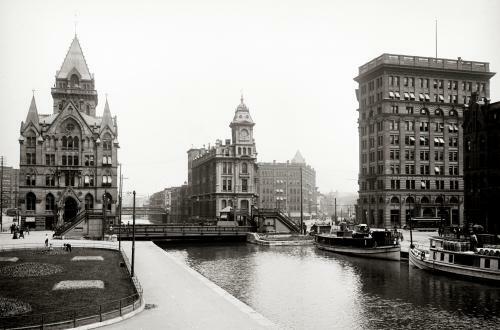 In fact, the impressive and historical buildings (banks) in Clinton Square (along the original downtown Syracuse route of the Erie Canal) were constructed to impress canal travelers and to let them know they arrived in a prosperous city (Syracuse). Engineering - The Erie Canal is sometimes called America’s First School of Engineering. At the time of its construction, there were no professional engineers, and the great minds behind the Canal studied canals in Europe to get a better idea of how to approach the project. Innovations such as the stump puller (wheels on an axle were chained to a tree stump and hooked to an oxen team to pull the stump out of the ground) were created to speed up the construction process. Still Shaping New York State - The impact on the State can be seen by looking at a modern map. With the exception of Binghamton and Elmira, every major city in New York falls along the trade route established by the Erie Canal, from New York City to Albany, through Schenectady, Utica and Syracuse, to Rochester and Buffalo. Nearly 80% of upstate New York&apos;s population lives within 25 miles of the Erie Canal. Today the Erie Canal is still accessible from Buffalo to New York City. 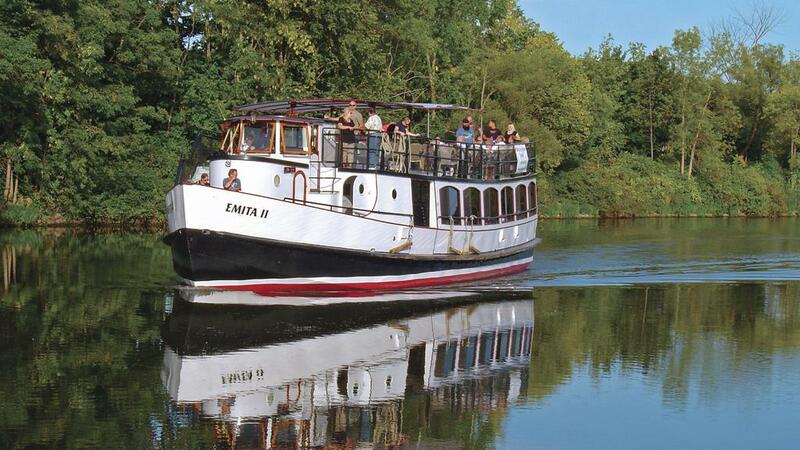 Travelers enjoy hour cruises, daily house boat rentals and even kayaking along the country&apos;s oldest man-made waterway. The tow paths where the mules were known to pull the canal boats are now used as walking, running and biking trails. In Syracuse, Mid-Lakes Navigation and Camillus Erie Canal Park provide lots of fun ways to enjoy the Canal. For more information on leisure activities along the Erie Canal, visit www.canals.ny.gov.